On Saturday, November 18, Jennifer Pharr Davis finishes what she started back on August 15: her 1,175-mile trek across North Carolina on the Mountains-to-Sea Trail. It’s a climatic event in more ways than one: she’s completing her three-month trek, and she’ll have to climb a sand dune at Jockey’s Ridge State Park that could be as tall as 100 feet (it fluctuates, depending upon the wind) to do it. 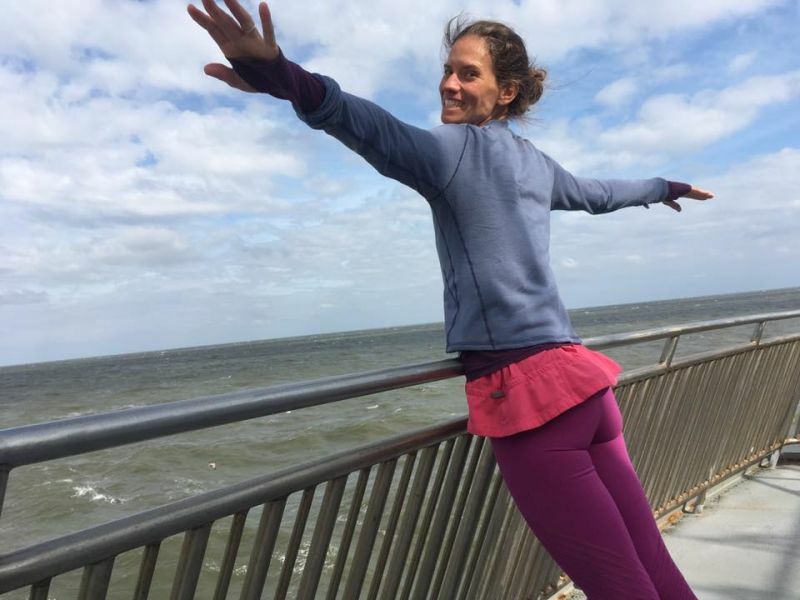 While Jen initially made a name by being a speed hiker — she once held the record for hiking the Appalachian Trail in a record 46 days — she plans to savor her last day on the trail. And that’s good news for you, because she’d like you to join her. There will be a brief ceremony at the top, followed by a celebration hosted by the Friends of Jockey’s Ridge, Jockey’s Ridge State Park Superintendent Joy Greenwood, and Friends of the Mountains-to-Sea Trail. There will be cake. As she has at her other stops along the way, Jen will be more than happy to chat and answer questions. Since Jen has been joined along the way by her family — husband Brew, now-5-year-old daughter Charley and 1-year-old Gus — this is a very family friendly event. It’s also a bit of a birthday celebration: Charley turned 5 on Monday. What do you bring to a 5-year-old’s birthday celebration? Jen promised Charley there would be kites — lots and lots of kites (a gaggle of kites? a kit of kites?) — at the finish, so if you have one, bring it and fly it in the almost-always-kite-flying-cooperative OBX wind! Concerned about the weather? Don’t be: the forecast currently calls for mostly sunny skies and a high of 65, with no chance of rain. 2:45 p.m. — When you should gather at the Jockey’s Ridge State Park Visitor Center to make sure you’re in time to hike in with Jen. 4:15 p.m. — When cake will be served. We’d love you to join in the celebration. To help us plan (i.e., to make sure there’s enough cake! ), let us know if you can join Jen by registering here.